AfterlifeLibrary.com is a virtual library of information related to life after death (the afterlife), past lives, between lives, reincarnation, near death experience, psychic phenomena and many other related topics. Look at What Universe Picked For You! If you know what you are looking for, use the NEW! Search Feature on the top right of this page. Own a Share of This Work! If you'd like to participate in this work, please consider becoming a patron. 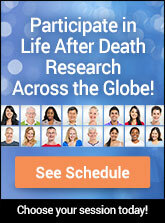 We are looking for people who are passionate about understanding life after death. Just visit our Patreon page to learn more. Thank you so much! Click a category below to start browsing. Are there any Christian mediums?